If you don't already know, we love pizza. However, I'm sure you ALL know that by now. What you may NOT know is that you can put virtually ANYTHING on pizza and it will still taste fabulous. Literally everything, so long as you thoughtfully consider the combination of flavors. So -- at least to us -- it seems there are no sauces, cheeses, veggies, or even fruits that are off limits. 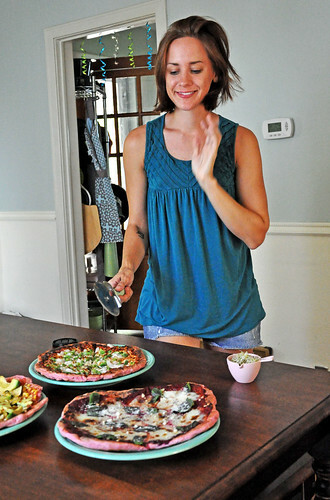 Why do we focus so much of our blog recipe content on pizza? 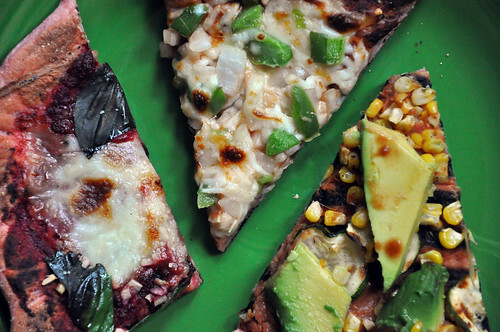 Because when done right, pizza is not only one of the best tasting lunches/dinners out there. 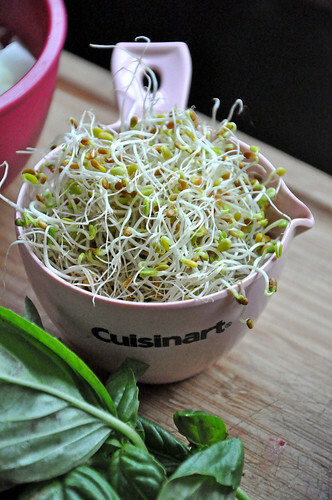 It also has the potential to be one of the most nutritionally complete. Making food work on both levels is important for everyone, especially athletes. Toppings are totally up to you. For our most recent adventure, we made three small pizzas. One of them would be vegan and Mexican-themed. Another would be the classic plain sauce, peppers, onions, and mozzarella. The other was a up in the air, but we went with a new twist on the tomato, fresh mozzarella, basil . 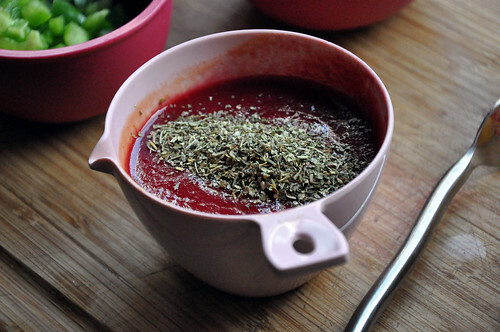 . . and that twist was all in the beet-tomato sauce, seasoned with cinnamon and cocoa. With some Parmesan cheese sprinkled in there, too. Mix everything together and enjoy. We recommend letting the sauce steal the show if you make it. Go with mozzarella and basil to play it safe. If you're more adventurous, please let us know what you use yours for! The sauce was DIVINE. 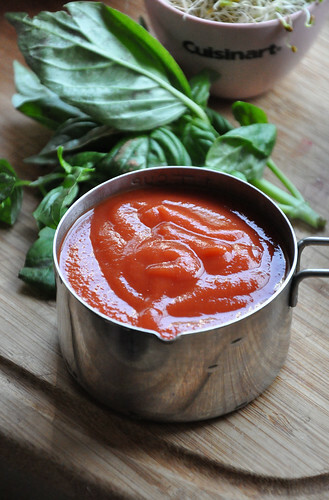 Of course, you can always stick with store-bought tomato sauce. Ours was low sodium (again for the peppers and onions pie). Toppings trick: Roast everything BEFORE baking. We like to grill pizza when we can. However, grilling is difficult when you have a lot of toppings because they take a long time to cook . . . but the crust can burn relatively easily. Solution: Preheat your oven to 400 degrees F and lay out your toppings (in our case -- corn, onions, zucchini), drizzle with a little olive oil, salt, and pepper, and roast until lightly browned. Then set aside until it's go time. Stephen is a huge fan of pairing hot with cold. Some of his favorite toppings make their way to the pizza after it's done cooking. Thing avocado, sprouts, spinach, and really any other salad-like items. He often starts with a plain pizza and piles on the cold veggies. All I hear is crunching. 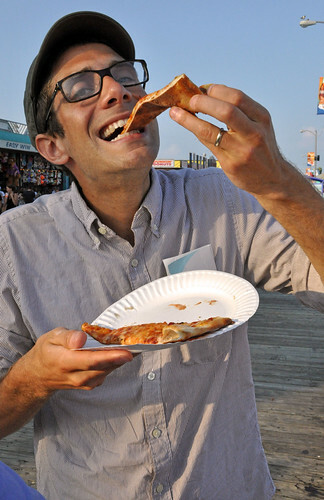 As long as he's happy -- and we can eat more pizza -- I'm happy! 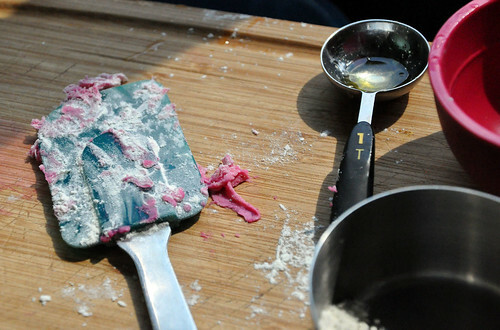 The cooking method also impacts the flavor and feel of your pizza. Since we like to eat it a lot, we like to vary our routine a lot. You can bake it rustic. You can fold it into a stromboli. 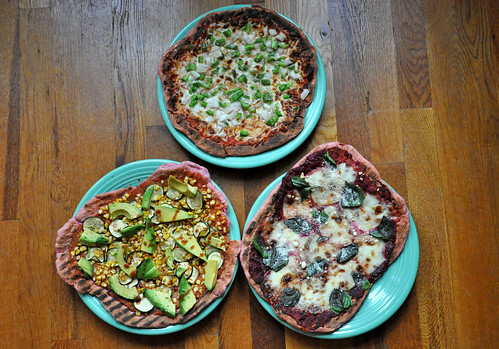 Making pizza vegan isn't as difficult as you might think. And no fake cheese is required to do the job. Our favorite vegan pizzas usually have some kind of tasty, unique sauce. So, yes. Back to sauces again. To make our Mexican vegan pizza . 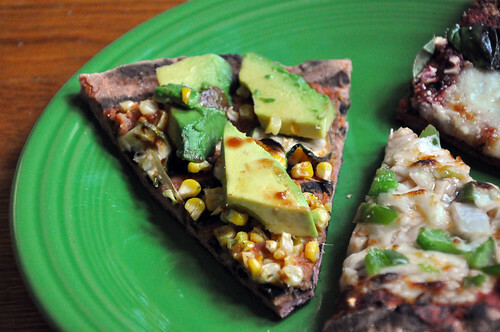 . .
We like to top vegan pizza with veggies -- hot and cold -- and more-times-than-not throw on some avocado. For extra flavor consider the following additions. 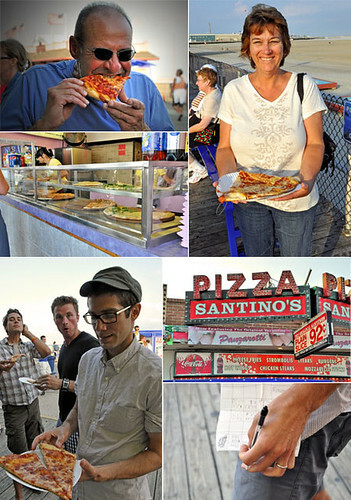 We could write about pizza for days. But now we have an assignment for you! If you aren't already, friend us on Facebook. Then, sometime in the next month (you have till Friday, October 8th), upload ONE photo (at least 500 pixels wide) to our gallery of the most unique (and tasty, not just weird) pizza you have made. Consider the ideas we've provided on our site. But be sure to come up with your own unique creation. Include a link to a recipe (or just tell us what's in your pie -- a basic recipe -- as the photo description). Vegan and vegetarian recipes only, please. We'll pick THREE finalists, try their pies, and post them to (never home)maker. From there, YOU'll have a chance to vote on the one you think looks and sounds the tastiest. The winner gets a perfect pizza-related prize -- a pizza stone (because even if you have one, it's always good to have a backup!)! We'll be rating the pizzas on crust, sauce, toppings, and cooking method.